FundedByMe is one of Scandinavia’s leading and fastest growing crowdfunding platforms. The company has a global business presence, with local partners in regions, such as South-East Asia and Central America. FundedByMe's cutting-edge crowdfunding platform, geared toward small and middle-sized businesses, offers investors and entrepreneurs a host of digital financing solutions that allow them to make and receive an investment efficiently and reliably. The platform is used by over 1500 new clients per month. 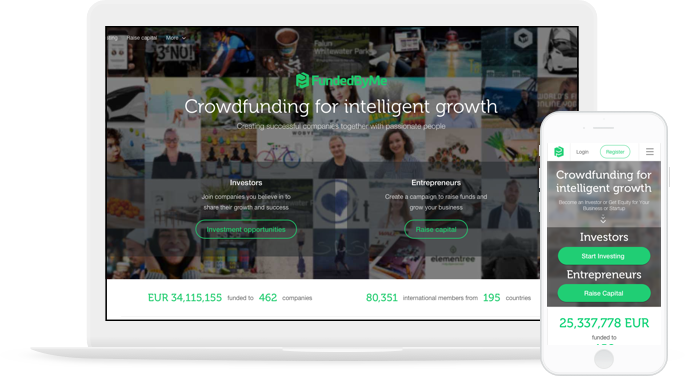 FundedByMe, one of Sweden’s principal crowdfunding platforms, universally known across the nation’s startup community, was looking to replace their development team. The new team was supposed to take over the expansion of the company’s principal crowdfunding platform. Vilmate was chosen to implement the project through a referral by one of the client’s senior officers who had previously cooperated with us in relation to a project for another client of ours. The client’s system is a large-scale crowdfunding application, geared toward small and middle-sized companies. The application is used to provide equity-based crowdfunding to such businesses. By using the application, startups can raise equity funding ranging from 150 000 SEK up to over 10 million SEK. For this purpose, the application allows entrepreneurs to create paid crowdfunding campaigns based on one of the three available service packages: Basic, Accelerator, and Performer. A campaign features a presentation of the project to be crowd-funded. The presentation can consist of a textual project description, a video and one or several photos. It states the goal of the campaign, the equity threshold that renders the campaign successful, equity per share, and the percentage of equity an investor will be entitled to. The available service packages vary in sophistication and price in accordance with the level of support they are used to provide. In particular, under the Accelerator package, entrepreneurs receive FundedByMe’s advisory support in creating their presentations, while under the Performer package FundedByMe’s experts create project presentations on entrepreneurs’ behalf. FundedbyMe was in need of a reliable partner to fully take over the application’s further development. This included overhauling several underperforming parts of the system that prevented its further expansion and automating several offline business processes. In order to take over the project’s implementation, Vilmate put together a team of 5 software engineers and 1 QA engineer. This team was managed directly by the client’s CTO. At the client’s request, the team was later augmented to include one more software engineer. The state the project was in when taken over by our team posed several significant challenges. Prior to when the project was transferred to us, it had been implemented for over 4 years by several development teams, none of which had lived up to our client’s expectations. The bulk of the system’s functionality and business logic was undocumented. This was further aggravated by the client having used several undocumented custom-tailored service packages. In addition, the state of the client’s relationships with our predecessors, who had a very high employee turnover, made a direct knowledge transfer impossible. The technology stack of the project included some conflicting technologies using which was not expedient. Some additional hurdles were also created by the frequently modified requirements for the functionality being developed by the Vilmate team. In order to overcome the above obstacles, our project team established direct communication with the client’s business stakeholders and lead experts, and, in particular, their Product Manager and Director of Marketing. Within a relatively short period of time, we had gained a thorough understanding of the system and its business logic. Several parts of the application had to be completely overhauled by us in order to allow the addition of new functionality. By now we have successfully resolved all the issues that had a negative impact on the application’s performance and precluded its further expansion. Payment functionality that allows making transactions via the application, thus eliminating several time-consuming offline business processes. Notification capability, used by entrepreneurs to send investors a confirmation that contains the details of the purchased equity. Vilmate’s project team has been involved in implementing the project for close to 1 year now and the project is, ongoing. The team is, currently, engaged in further expanding the system’s functionality. With a view to achieving a better system performance, we are currently engaged in migrating the whole of the application’s Front-end from JQuery to AngularJS. Due to Vilmate’s involvement in the project, FundedByMe has, finally, been able to solve the mission-critical and long-standing problem of being unable to find a development partner they could rely on in implementing the project. The performance of the client’s crowdfunding platform has been dramatically improved by us and the platform can now be further expanded. Moreover, Vilmate’s project team has added highly important functionality, thus making the platform a lot more powerful and contributing significantly to our client’s competitiveness. In particular, with the help of our technical support, FundedByMe has been able to expand their market into Finland, South-East Asia, and some other geographies. Vilmate is an extremely reliable and amenable business partner whose software engineers are among the best I’ve seen. The company’s technical expertise is impressive indeed.. They are able to meet, virtually, any technical challenge. We definitely want to continue working with them!